What does it take to work at Dig It Civil? Dig It Civil are always on the lookout for talented staff, either eager university graduates wanting work experience or experienced construction staff looking for a new opportunity but, what does it take to work here? This month we've been hard at work at Blandford Avenue in Bronte, working along-side Orisi Projects. This project saw us demolish a single story house that was high above street level. 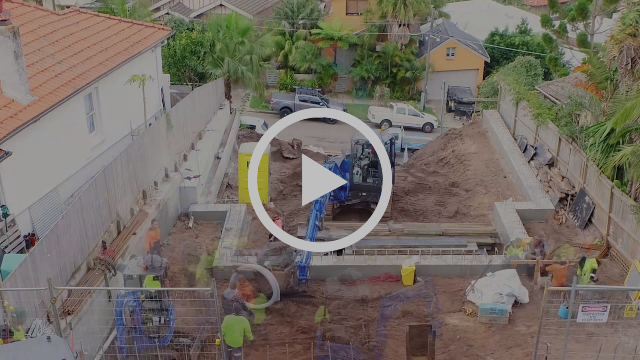 We installed concrete contagious piles and capping beams, shotcrete around the perimeter for a new 4 story apartment with new garages, storage, bedrooms and rear yard and then we excavated approximately 1200m3 of sand and installed approximately 2000m of hand augured piles. Click here to see us in action! Weeks of hard work over in seconds! Time-Lapse Video of Dig It Civil working hard at Blandford Avenue Bronte. It’s an enjoyable environment in the office and in the field! Even though everyone is spread out over a lot of different projects there is still good communication and a good sense of team work and working together. Our projects are often carried out in difficult conditions and long hours are often required, yet everyone is doing their job to the best of our ability, staying positive and working as a team. This all helps create a good work environment. 4. Being one of our newest staff members, what advice would you give to other new members of staff? 5. Before working at Dig it Civil, what was the most unusual or interesting job you’ve ever had? I worked for MacDonald Contracting for 15 years before Dig it. Over that time I spent a lot of time in underground basements in the city, and interesting excavation sites all over Sydney. However the most unusual job I had was in Ireland. Robin and I were travelling across Europe (a long time ago) and we were running low on money, we ended up getting a job in a small boutique hotel in Killarney Ireland. My job was the “Concierge”, my main role was to help the wealthy American golfers with their luggage and golf clubs and then collect a healthy tip! I had never done anything like this before, we had such a good time doing something different as well as enjoying the Irish culture. Spending time with my family. I have been married to Robin my wonderful wife for 23 years, without her I couldn’t be who I am or do what I do week to week. We have three great teenage kids who are a real blessing and they also keep us busy and on our toes! I also love playing golf, (trying to play golf) It’s such a tough game but walking around a picturesque course with mates or my sons on a sunny day is awesome. Craig with his two lovely sons playing a spot of golf.